Wow. 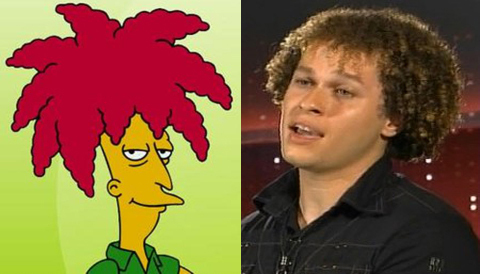 Who knew Sideshow Bob could sing like that? Last night’s American Idol auditions were held in Los Angeles, where we met 25-year old Chris Golightly, who delivered a strong version of “Stand By Me,” channeling the original by Sam Cooke. We also learned Chris’s compelling backstory: since age 18-months, he bounced around from foster home to foster home. That he shares a hairstyle with an evil genius on The Simpsons unfortunately went unaddressed and remains a mystery. Chris got a “yes” from each of the four judges. But Simon Cowell and Katy Perry emphasized that theirs were “yes with a small y.” Katy went as far as to say that Idol isn’t “a Lifetime movie,” as she reluctantly agreed to move Chris on to the next round. Looks like Chris will need to show he’s contemporary and relevant to win over all of the judges. And how ’bout that Katy Perry? I’m a big fan. But depending on your point-of-view, as an Idol guest judge she was either a straight shot of music industry truth–or a cynical pro who’s forgotten what it was like breaking into the biz. I say it was a little of both. The guest judge duties were actually split over the two-day audition between Katy and Avril Lavigne, whose approach was similar. The other big audition came from Andrew Garcia, who’s a kind of Latino Danny Gokey. Andrew gave what was probably the best vocal of the night on Maroon 5‘s, “Sunday Morning.” He’s got a look that stands out (cool glasses). He’s a devoted family guy. And has a backstory that will earn him fans (his parents were gang members who moved to the ‘burbs to give their kids the life they didn’t have). Others moving on to Hollywood: Jim Ranger, another dad who sang an original song (“Drive”), which almost never impresses the judges, but this time it did; Mary Powers (“Love Is A Battlefield”), who’s edgy voice and looks got punk rock props from Avril, even as Simon suggested she didn’t need the costume; And Tasha Layton, who sounded a lot her idol, Joss Stone–maybe a little too much. It’s early in the process. But as always, carving out their own identities will be crucial to sticking around. On the freak show side of the festivities, I gotta bestow a few words upon the following. Austin Fulmer, who was like Mick Jagger without the swagger. Austin sang Cheap Trick‘s, “Surrender,” and has apparently mastered a dance move that I can only describe as “sitting down jumping jacks.” The judges didn’t go for Austin’s tricks, nor did they surrender. Early in the show, Neil Goldstein sang a Meatloaf song and matched the notoriously glistening Mr. Loaf bead of sweat for bead of sweat. And then there was the mess that is Jason Green, whose long locks, feminine mannerisms, and scary, Broadway take on the Divynals, “I Touch Myself,” made Katy feel “dirty” and Simon “uncomfortable.” I gotta a feeling if Katy kissed this guy–she’d still be kissing a girl. That’s what me thinks this morning. Your thoughts? Paula Adbul, you were missed last night. We could have used a downpour of Paula tears. Or Paula trading barbs with Simon. At the very least, some garbled, unintelligible reasoning why she says “yes” to someone going to Hollywood. Something to fun up the proceedings on American Idol. Instead, we got one of the more lackluster audition episodes in recent memory. Contrived crazy (Brian Krause, an obvious put-on who sang Tiny Tim), boring backstories (Divorce? Asthma? ), and only a small handful of standouts. The math tells the story. Twelve thousand people waited in line to try out. Just 13 walked away with Golden Tickets. Among the interesting hopefuls: Katelyn Epperly (“Syrup And Honey” by Duffy), an Earthy-voiced original; Charity Vance (“Summertime”), who has been able to mold her limited vocal range into something unique that works; And John Park, for lack of a better description, an Asian soul singer, whose “bottom end” Shania simply had to compliment (the first in string of musical comments that sounded dirty). Ah, to be John Park! Then there was Angela Martin, who demonstrated her ample skillz (again) on Mary J Blige‘s, “Just Fine.” Anglela showed she deserves another shot. She’s been cut the last two seasons–last year after making the Top 50 (something about a traffic ticket). We’ll see if the cloud that’s been following her around has made way for blue skies. Finally, and very briefly, there’s Keith Sample (“Heaven” by Bryan Adams). I say briefly because that’s how much screen time he got last night. Something about his voice caught my ear. Sounded fresh. Of course, that’s based on the tiny portion the Idol folks served us. So, hey, those are my thoughts. What you thinkin’? Let me know! Seems to me, after this season, all American Idol winners will need to have an asterisk by their name. They didn’t have to face the judgment firing-squad of Simon Cowell. The journey began last night to crown the last “real” American Idol, just one day after Simon announced that Season 9 would be his last. The timing was not a coincidence. Might as well juice the ratings for this season (the first without Paula Abdul). Last “real” American Idol? Okay, it might not be fair to dismiss future Kelly, Carrie and Krises like that. But there are big unknowns. What effect will Simon’s departure have on the show? Can it survive without him? Is American Idol the kind of franchise that will span the decades? Is it like the Tonight Show (56 years) or Saturday Night Live (35 years), able to continue and prosper even as it changes hosts and cast members? Or is this the beginning of the end for television’s number one show? I have no doubt they’ll hire someone new and move forward without Simon next season. I have no idea how viewers will respond to that. But, hey, at least Idol’s not on NBC, whose current crop of execs have made a debacle out of the television institution that is the Tonight Show. So, about last night. Auditions in Boston. Victoria Beckham guesting as “The Fourth Judge.” Beckham didn’t add much to the festivities, except to mix it up with Simon in a good ol’ fashioned duel of British accents. That’s probably why she got the call. We know the formula for these audition shows. A whole lotta crazy and bad singing sandwiched between some talent and compelling back-stories. All of these were in play last night. I’ve always said it’s hard to gauge too much from these auditions. After all, contestants come in with their best material, stuff they’ve practiced over-and-over. What separates the real talent is the ability to take on new material, rehearse it on a tight schedule, and sound great doing it. I defy anybody to re-watch last season’s auditions and declare, “Oh, yes! There’s the winner!” Only a few seconds of Kris Allen‘s audition aired, and none of his Hollywood Week solo performances made the cut. Around the Idol water cooler this morning, people are probably mentioning “The Italian Dude,” Amadeo Diricco. 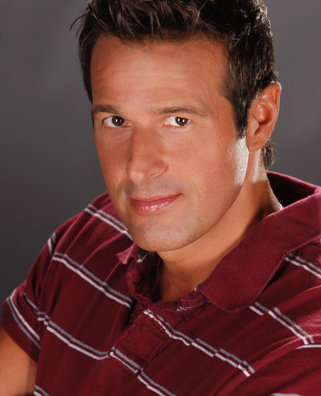 Seems like a nice guy, great old-school Italian personality. Belted out some blues, brother. Fans of the show are going to like this guy. But I suspect there’s a wall. And if blues is his one trick, he gonna smack right into that wall. So here’s hoping he knows more than Muddy Waters songs. Also notable were Tyler Grady (70s rocker looks, smooth vocals), Leah Laurenti (jazzy “Blue Skies”) and Justin Williams (NextGen Buble). And finally, Ashley Rodriguez got major kudos from the judges. 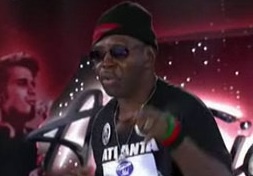 Great look, nice job on Alicia Keys‘, “If I Ain’t Got You.” Still, I wanted to hear more. So I did a search this morning. Turns out she’s got a bunch of stuff on YouTube. Search her stage name, “Ashley Makailah.” Here’s her version of a Sara Bareilles song called, “Gravity.” She’s the real deal. Definitely look for her to make the Top 12. As always, I’m curious how you saw things. So lemme know your thoughts!